March is usually the time all the best laid 'this time next year we'll be millionaires, Rodders' plans go the same way as they do every year. 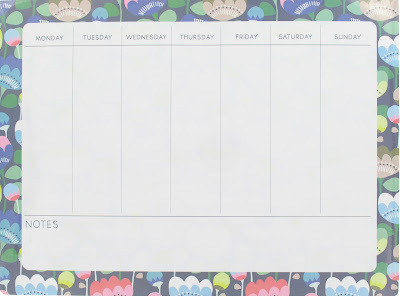 I was just about to give up, but then my lovely Mama came home one day with a weekly planner for me from our local giftshop. 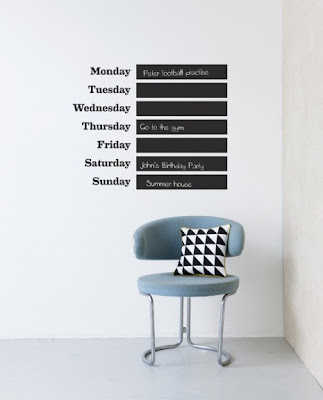 It's all structured and pretty, and it makes me realise I can't spend all day watching reruns of Friends and galvanised me into getting organised. Otherwise, I'll end up as The One Where Laura Can't Pay Her Rent. You should totally get one. Like the amazing, colourful weekly planner pad from Lollipop, above. It has individual boxes so you can share it with your loved ones, but SCREW THEM I WANT ALL THE SUCCESS. Those boxes are mine, all mine: one for meal plans, one for writing plans, one for appointments and parties, one for biscuit breaks. It's £9. 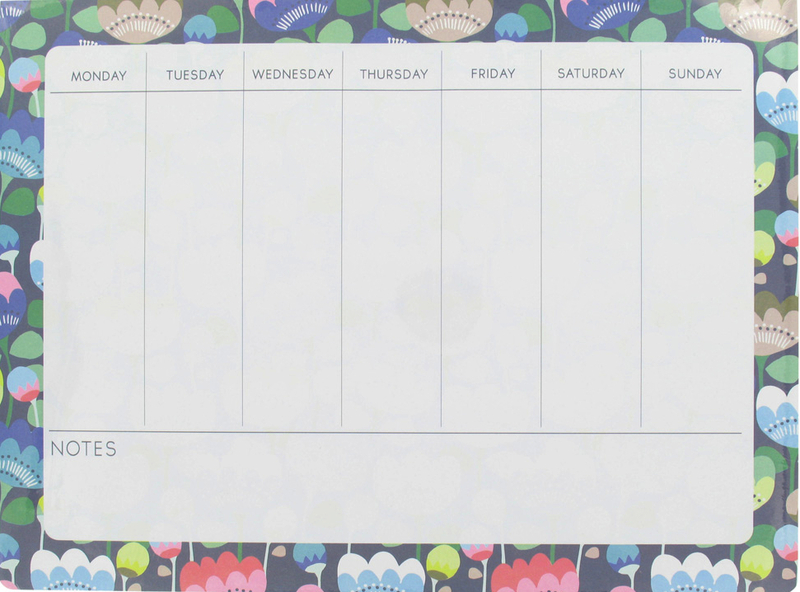 Unsurprisingly, Paperchase come up trumps with this meadow bloom desk planner. 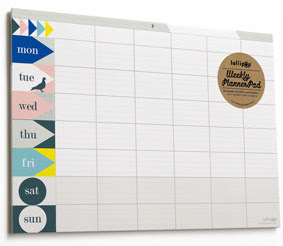 Perfectly structured to make every day one gigantic list of plots and schemes, it also have a sneaky notes section for inspirational quotations, or in my case doodles of giraffes holding a tea party. It's £7. 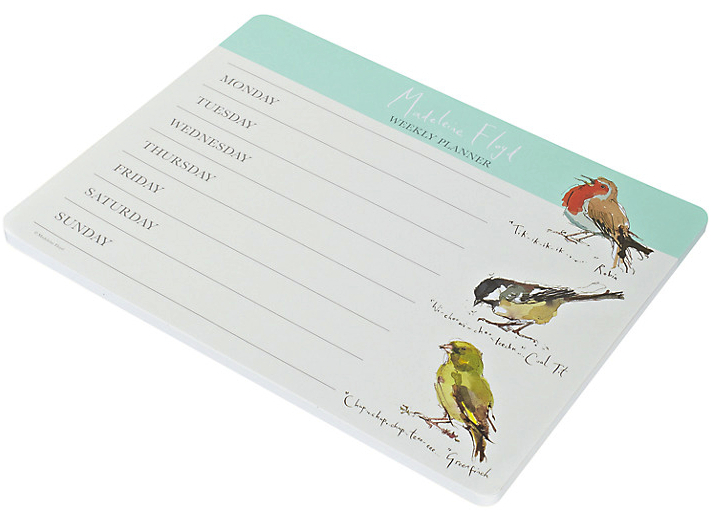 The Madeleine Floyd Birdsong planner does the doodles for you. I wasn't as sold on the style of this planner until I zoomed in and saw that beneath each bird Madeleine has written a little example of what they might say. Such as "wi-choo wi-choo" and "chup, chup, tzoo-eee...". I'll imagine that's birdspeak for "Get on with your work, Laura, and stop daydreaming about us talking to you!" It's £5.99 from John Lewis. Lastly, if you want to be loud and proud about your weekly plan, I'd opt for the This Week wallsticker from Rose and Grey. It's £59.95 but now there's no chance of you forgetting what you have to do.